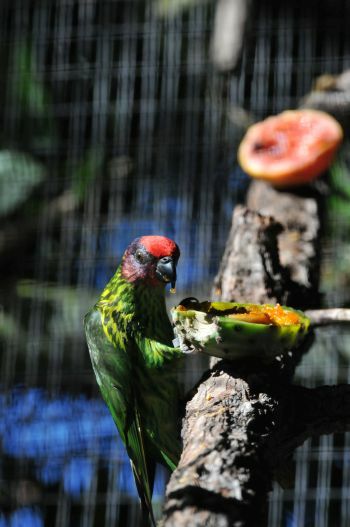 One of the fundamental key for the maintenance of parrots is the feeding variety. The diet variety is of particular importance for the psittacids. So is the freshness of food and the use of temporality. The birds will receive natural chemical messages that benefit their metabolism at any time. Using this system we can guide our birds to face the different stages of the year in the best conditions. In this way, when they receive annual growth herbs, they know it’s time to prepare for reproduction. When we give them fruits rich in water, they know it is a hot season where not only water hydration is important in order to still their thirst. There are basic fruits like the apple or the banana that are usually available all year round. Enriching this base allows the animals to benefit from the multiple contributions they suppose. Change of shapes, textures, flavors and colors. The seeds of the prickly pear figs are much appreciated. The individuals spend time and use their skills in order to consume the pulp around each grain. In fact the different species do not consume the small seeds in the same way. For instance, the Psittacids disperse the seeds and prefer the fruits that are inside. Fruits like the seasonal papaya are very healthy for all species. It contains enzymes that improve the digestion. It is interesting to see how according to each species they prefer this fruit in different degrees of maturation. The Asian species, for instance, usually prefer the green ones. At Loro Parque Fundación we take advantage of the large fruit season of the Canary Islands thanks to the benignity of their climate. Our farms produce 100% organic food, where only environmentally friendly organic products are used. This is the reason why they have an intense flavour and aroma which increase the appetite of our parrots. The vitamin intake allows maintaining a healthy population that responds to the stimuli correctly. Through the enrichment of the diet it is possible that the individuals develop a robust immune system. 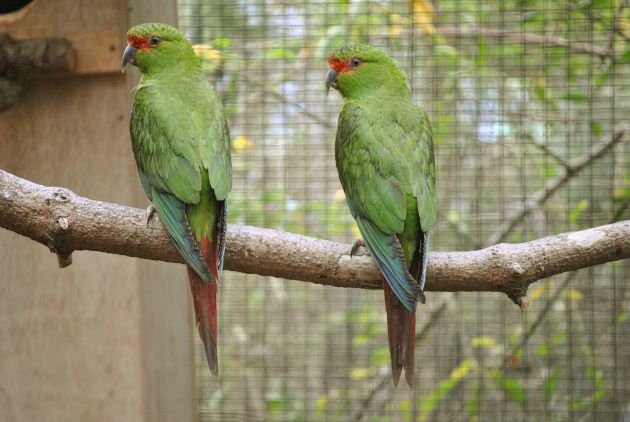 The diet richness and the constant work over the years made possible that even species like the slender-billed parakeet (Enicognathus leptorhynchus) got offspring in this still going on breeding season. These species do not reproduce easily and are sensitive to the different management parameters. The Blue throated macaw (Ara glaucogularis) has also been reproduced with great success. Its plumage reveals its vitality even for inexperienced eyes. We have introduced some adjustments in the diets of the birds that are in the independence phase. These adjustments help us to stimulate the flight of the still young species and to improve their growth in order to develop into healthy and beautiful species. The university students received information of the LPF projects. They were also told about the importance to assist to conventions and seminars. 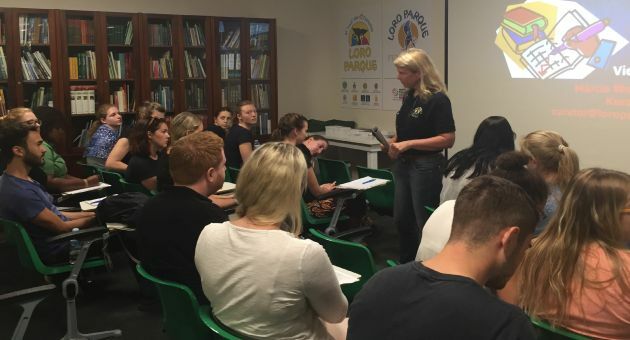 During the month of October Loro Parque Fundación has received several important visits. Among them, the visit of 20 veterinary students from the University of Giessen. The students received during two weeks theoretical and practical training in animal management. 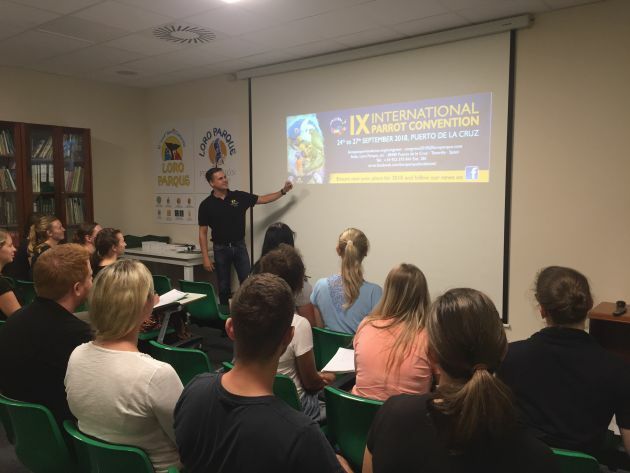 The topics covered were biosecurity, nutrition, evolution and conservation. We are sure that these future veterinarians will do a great job in the near future. Marcia Weinzettl explained the importance of a good management in order to avoid diseases. 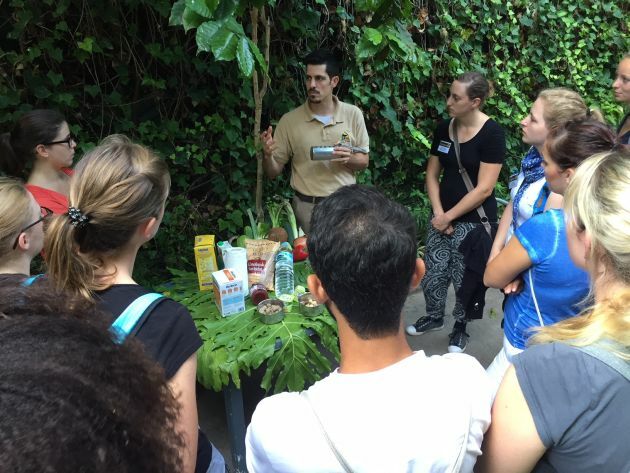 Iñaki Ezquerro, curator of the mammal department, explained the importance of the diet and environmental enrichment. The LPF Advisory Board meeting took also place during October. The advisory members and the LPF team came together in order to decide what projects are going to be financed in 2018. On this occasion, 36 projects were approved that will be supported financially with more than one million dollars. This is very good news for the threatened species in their natural environment that thanks to Loro Parque Fundación are being saved from extinction. The intensive training and conservation activity of parrots has led us to participate at the IV International Avian Convention hosted by the Avian Society of India. 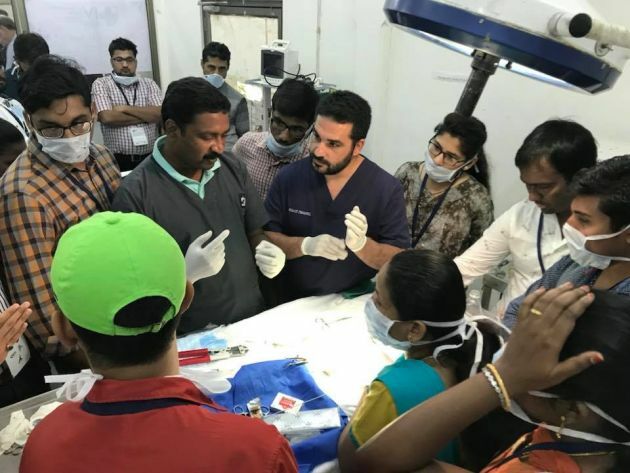 Our veterinary expert Nuhacet Fernández imparted his knowledge and skills to numerous professionals from the India avian sector.